On click, we want the value of this stop to go from 0% to 100% (or the other way around, depending on the state it's already in) over the course of NF frames. If an animation is already running at the time of the click, we stop it, change its direction, then restart it. We also need a few variables such as the request ID (this gets returned by requestAnimationFrame), the index of the current frame (an integer in the [0, NF] interval, starting at 0) and the direction our transition is going in (which is 1 when going towards 100% and -1 when going towards 0%). While nothing is changing, the request ID is null. We also set the current frame index to 0 initially and the direction to -1, as if we've just arrived to 0% from 100%. Now all that's left is to populate the update() function. Within it, we update the current frame index f. Then we compute a progress variable k as the ratio between this current frame index f and the total number of frames NF. Given that f goes from 0 to NF (included), this means that our progress k goes from 0 to 1. Multiply this with 100% and we get the desired stop. After this, we check whether we've reached one of the end states. If we have, we stop the animation and exit the update() function. The way the pseudo-element is made to contrast with the background below is explained in an older article. This gives us a sort of a "vertical blinds" effect that cannot be replicated in a clean manner with just CSS if we don't want to use more than one element. Note that in the case of conic-gradient(), we must use a unit for the zero value (whether that unit is % or an angular one like deg doesn't matter), otherwise our code won't work - writing conic-gradient(#ff9800 var(--stop, 0%), #3c3c3c 0) means nothing gets displayed. The Experimental Web Platform Features flag enabled in Chrome Canary (63.0.3210.0). Just for the purpose of displaying conic gradients in the browser, there's a polyfill by Lea Verou and this works cross-browser but doesn't allow using CSS custom properties. Recording of how our first conic-gradient() demo works in Chrome with the flag enabled (live demo). Recording of how our second conic-gradient() demo works in Chrome with the flag enabled (live demo). If we want to mix units for the stop value, things get hairier as we need to compute more things (box dimensions when mixing % and px, font sizes if we throw em or rem in the mix, viewport dimensions if we want to use viewport units, the length of the 0% to 100% segment on the gradient line for gradients that are not horizontal or vertical), but the basic idea remains the same. An ease-in kind of function means the change in value happens slow at first and then accelerates. ease-out is exactly the opposite - the change happens fast in the beginning, but then slows down towards the end. The ease-in (left) and ease-out (right) timing functions (live). The slope of the curves above gives us the rate of change. The steeper it is, the faster the change in value happens. We can emulate these functions by tweaking the linear method described in the first section. Since k takes values in the [0, 1] interval, raising it to any positive power also gives us a number within the same interval. The interactive demo below shows the graph of a function f(k) = pow(k, p) (k raised to an exponent p) shown in purple and that of a function g(k) = 1 - pow(1 - k, p) shown in red on the [0, 1] interval versus the identity function id(k) = k (which corresponds to a linear timing function). When the exponent p is equal to 1, the graphs of the f and g functions are identical to that of the identity function. When exponent p is greater than 1, the graph of the f function is below the identity line - the rate of change increases as k increases. This is like an ease-in type of function. The graph of the g function is above the identity line - the rate of change decreases as k increases. This is like an ease-out type of function. In this interactive demo, we want the graphs of the f and g functions to be as close as possible to the dashed lines, which represent the ease-in timing function (below the identity line) and the ease-out timing function (above the identity line). The ease-in-out timing function (live). So how can we get something like this? Well, that's what harmonic functions are for! More exactly, the ease-in-out out shape is reminiscent the shape of the sin() function on the [-90°,90°] interval. The sin(k) function on the [-90°,90°] interval (live). However, we don't want a function whose input is in the [-90°,90°] interval and output is in the [-1,1] interval, so let's fix this! This means we need to squish the hashed rectangle ([-90°,90°]x[-1,1]) in the illustration above into the unit one ([0,1]x[0,1]). The sin(k·π) function on the [-.5,.5] interval (live). The sin((k - .5)·π) function on the [0,1] interval (live). The sin((k - .5)·π) + 1 function on the [0,1] interval (live). The (sin((k - .5)·π) + 1)/2 function on the [0,1] interval (live). This turns out to be a good approximation of the ease-in-out timing function (represented with an orange dashed line in the illustration above). Let's say we want to have a bunch of elements with a linear-gradient() (like in the third demo). On click, their --stop values go from 0% to 100%, but with a different timing function for each. The update function is pretty much the same, except we set the --stop custom property for every element as the value returned by the corresponding timing function when fed the current progress k. Also, when resetting the --stop to 0% at the end of the animation, we also need to do this for every element. They all start and finish at the same time, but while the progress is constant for the linear one, the ease-in one starts slowly and then accelerates, the ease-out one starts fast and then slows down and, finally, the ease-in-out one starts slowly, accelerates and then slows down again at the end. I first came across the concept years ago, in Lea Verou's CSS Secrets talk. These happen when the y (even) values in a cubic-bezier() function are outside the [0, 1] range and the effect they create is of the animated value going outside the interval between its initial and final value. This bounce can happen right after the transition starts, right before it finishes or at both ends. A bounce at the start means that, at first, we don't go towards the final state, but in the opposite direction. For example, if want to animate a stop from 43% to 57% and we have a bounce at the start, then, at first, out stop value doesn't increase towards 57%, but decreases below 43% before going back up to the final state. Similarly, if we go from an initial stop value of 57% to a final stop value of 43% and we have a bounce at the start, then, at first, the stop value increases above 57% before going down to the final value. A bounce at the end means we overshoot our final state and only then go back to it. If want to animate a stop from 43% to 57% and we have a bounce at the end, then we start going normally from the initial state to the final one, but towards the end, we go above 57% before going back down to it. And if we go from an inital stop value of 57% to a final stop value of 43% and we have a bounce at the end, then, at first, we go down towards the final state, but, towards the end, we pass it and we briefly have stop values below 43% before our transition finishes there. If what they do is still difficult to grasp, below there's a comparative example of all three of them in action. These kinds of timing functions don't have their own keywords associated, but they look cool and they are what we want in a lot of situations. Just like in the case of ease-in-out, the quickest way of getting them is by using harmonic functions. The difference lies in the fact that now we don't start from the [-90°,90°] domain anymore. For a bounce at the beginning, we start with the [s, 0°] portion of the sin() function, where s (the start angle) is in the (-180°,-90°) interval. The closer it is to -180°, the bigger the bounce is and the faster it will go to the final state after it. So we don't want it to be really close to -180° because the result would look too unnatural. We also want it to be far enough from -90° that the bounce is noticeable. In the interactive demo above, the hashed area ([s,0]x[sin(s),0]) is the area we need move and scale into the [0,1]x[0,1] area in order to get our timing function. The part of the curve that's below its lower edge is where the bounce happens. You can adjust the start angle using the slider and then click on the bottom bar to see how the transition looks for different start angles. The sin(-k·s) function on the [-1,0] interval (live). The sin(-(k - 1)·s) function on the [0,1] interval (live). We then shift the codomain up by its value at 0 (sin((1 - 0)*s) = sin(s)). Our function is now sin((1 - k)·s) - sin(s) and our codomain [0,-sin(s)]. The sin(-(k - 1)·s) - sin(s) function on the [0,1] interval (live). The 1 - sin((1 - k)·s)/sin(s) function on the [0,1] interval (live). For a bounce at the end, we start with the [0°, e] portion of the sin() function, where e (the end angle) is in the (90°,180°) interval. The closer it is to 180°, the bigger the bounce is and the faster it will move from the initial state to the final one before it overshoots it and the bounce happens. So we don't want it to be really close to 180° as the result would look too unnatural. We also want it to be far enough from 90° so that the bounce is noticeable. In the interactive demo above, the hashed area ([0,e]x[0,sin(e)]) is the area we need to squish and move into the [0,1]x[0,1] square in order to get our timing function. The part of the curve that's below its upper edge is where the bounce happens. The sin(k·e) function on the [0,1] interval (live). What's still left to do is to expand the codomain into the [0,1] range. We do this by dividing by its upper limit (which is sin(e)). This means our final easing function is sin(k·e)/sin(e). The sin(k·e)/sin(e) function on the [0,1] interval (live). If we want a bounce at each end, we start with the [s, e] portion of the sin() function, where s is in the (-180°,-90°) interval and e in the (90°,180°) interval. The larger s and e are in absolute values, the bigger the corresponding bounces are and the more of the total transition time is spent on them alone. On the other hand, the closer their absolute values get to 90°, the less noticeable their corresponding bounces are. So, just like in the previous two cases, it's all about finding the right balance. In the interactive demo above, the hashed area ([s,e]x[sin(s),sin(e)]) is the area we need to move and scale into the [0,1]x[0,1] square in order to get our timing function. The part of the curve that's beyond its horizontal edges is where the bounces happen. We start by shifting the domain to the right into the [0,e - s] interval. This means our function becomes sin(k + s) (we can check that 0 + s = s and that e - s + s = e). The sin(k + s) function on the [0,e - s] interval (live). Then we shrink the domain to fit into the [0,1] interval, which gives us the function sin(k·(e - s) + s). The sin(k·(e - s) + s) function on the [0,1] interval (live). Moving on to the codomain, we first shift it up by its value at 0 (sin(0·(e - s) + s)), which means we now have sin(k·(e - s) + s) - sin(s). This gives us the new codomain [0,sin(e) - sin(s)]. The sin(k·(e - s) + s) - sin(s) function on the [0,1] interval (live). Finally, we shrink the codomain to the [0,1] interval by dividing with the range (sin(e) - sin(s)), so our final function is (sin(k·(e - s) + s) - sin(s))/(sin(e - sin(s)). The (sin(k·(e - s) + s) - sin(s))/(sin(e - sin(s)) function on the [0,1] interval (live). The s and e variables are the values we get from the two range inputs that allow us to control the bounce amount. We use a custom timing function that allows us to have a bounce at the end and we make this animation alternate - that is, go from the final state (translate(50vw)) back to the initial state (no translation) for the even-numbered iterations (second, fourth and so on). One important thing to notice here is that, for the even-numbered iterations, our bounce doesn't happen at the end, but at the start - the timing function is reversed. Visually, this means it's reflected both horizontally and vertically with respect to the .5,.5 point. In CSS, there is no way of having a different timing function other than the symmetrical one on going back if we are to use this set of keyframes and animation-direction: alternate. We can introduce the going back part into the keyframes and control the timing function for each stage of the animation, but that's outside the scope of this article. In the initial state, the stop is at 85%. We animate it to 26% (which is the final state) using a timing function that gives us a bounce at the end. This means we go beyond our final stop position at 26% before going back up and stopping there. This is what happens during the odd iterations. During the even iterations, this behaves just like in the CSS case, reversing the timing function, so that the bounce happens at the beginning, not at the end. But what if we don't want the timing function to be reversed? In this case, we need to use the symmetrical function. For any timing function f(k) defined on the [0,1] interval (this is the domain), whose values are in the [0,1] (codomain), the symmetrical function we want is 1 - f(1 - k). Note that functions whose shape is actually symmetrical with respect to the .5,.5 point, like linear or ease-in-out are identical to their symmetrical functions. So what we do is use our timing function f(k) for the odd iterations and use 1 - f(1 - k) for the even ones. We can tell whether an iteration is odd or even from the direction (dir) variable. This is 1 for odd iterations and -1 for even ones. This means we can combine our two timing functions into one: m + dir*f(m + dir*k). Gradient stops are not the only things that aren't animatable cross-browser with just CSS. The results seem a bit inconsistent. 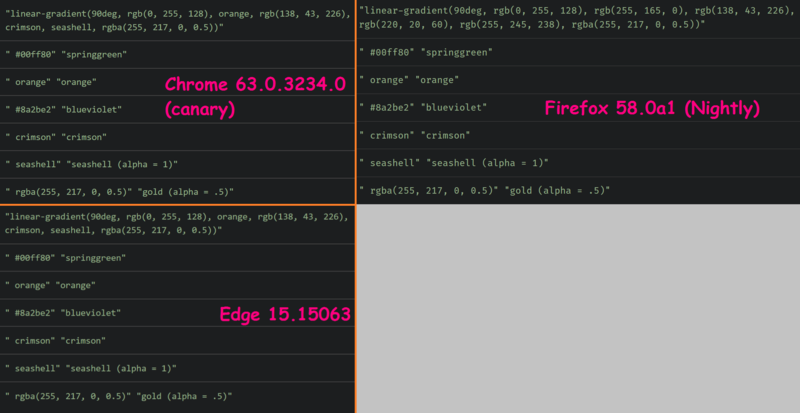 Screenshots showing what gets logged in Chrome, Edge and Firefox (live). All browsers also agree when reading the custom properties directly, though, this time, what we get doesn't seem to make much sense: orange, crimson and seashell are returned as keywords regardless of how they were set, but we get hex values for springgreen and blueviolet. Except for orange, which was added in Level 2, all these values were added to CSS in Level 3, so why do we get some as keywords and others as hex values? For the background-image, Firefox always returns the fully opaque values only as rgb(), while Chrome and Edge return them as either keywords or hex values, just like they do in the case when we read the custom properties directly. Oh well, at least that lets us know we need to take into account different formats. So the first thing we need to do is map the keywords to rgb() values. Not going to write all that manually, so a quick search finds this repo - perfect, it's exactly what we want! We can now set that as the value of a CMAP constant. The next step here is to create a getRGBA(c) function that would take a string representing a keyword, a hex or an rgb()/ rgba() value and return an array containing the RGBA values ([red, green, blue, alpha]). Do note however that, in general, RGBA transitions are not the best place to illustrate bounces. That's because the RGB channels are strictly limited to the [0,255] range and the alpha channel is strictly limited to the [0,1] range. rgb(255, 0, 0) is as red as red gets, there's no redder red with a value of over 255 for the first channel. A value of 0 for the alpha channel means completely transparent, there's no greater transparency with a negative value. By now, you're probably already bored with gradients, so let's switch to something else! At this point, we cannot alter the geometry of SVG elements via CSS. We should be able to as per the SVG2 spec and Chrome does support some of this stuff, but what if we want to animate the geometry of SVG elements now, in a more cross-browser manner? Our first example is that of a circle whose radius goes from nothing (0) to a quarter of the minimum viewBox dimension. We keep the document structure simple, without any other aditional elements. Another SVG example is a smooth pan and zoom map demo. In this case, we take a map like those from amCharts, clean up the SVG and then create this effect by triggering a linear viewBox animation when pressing the +/ - keys (zoom) and the arrow keys (pan). When pressing the + key, what we want to do is zoom in. The action we perform is 'zoom' in the positive direction - we go 'in'. Similarly, when pressing the - key, the action is also 'zoom', but in the negative (-1) direction - we go 'out'. When pressing the arrow left key, the action we perform is 'move' along the x axis (which is the first axis, at index 0) in the negative (-1) direction - we go 'left'. When pressing the arrow up key, the action we perform is 'move' along the y axis (which is the second axis, at index 1) in the negative (-1) direction - we go 'up'. When pressing the arrow right key, the action we perform is 'move' along the x axis (which is the first axis, at index 0) in the positive direction - we go 'right'. When pressing the arrow down key, the action we perform is 'move' along the y axis (which is the second axis, at index 1) in the positive direction - we go 'down'. We then get the SVG element, its initial viewBox, set the maximum zoom out level to these initial viewBox dimensions and set the smallest possible viewBox width to a much smaller value (let's say 8). We also create an empty current navigation object to hold the current navigation action data and a target viewBox array to contain the final state we animate the viewBox to for the current animation. Now let's see what we do if we zoom. First off, and this is a very useful programming tactic in general, not just here in particular, we get the edge cases that make us exit the function out of the way. So what are our edge cases here? The first one is when we want to zoom out (a zoom in the negative direction) when our whole map is already in sight (the current viewBox dimensions are bigger or equal to the maximum ones). In our case, this should happen if we want to zoom out at the very beginning because we start with the whole map in sight. The second edge case is when we hit the other limit - we want to zoom in, but we're at the maximum detail level (the current viewBox dimensions are smaller or equal to the minimum ones). Now that we've handled the edge cases, let's move on to the main case. Here, we set the target viewBox values. We use a 2x zoom on each step, meaning that when we zoom in, the target viewBox dimensions are half the ones at the start of the current zoom action, and when we zoom out they're double. The target offsets are half the difference between the maximum viewBox dimensions and the target ones. Next, let's see what we do if we want to move instead of zooming. In a similar fashion, we get the edge cases that make us exit the function out of the way first. Here, these happen when we're at an edge of the map and we want to keep going in that direction (whatever the direction might be). Since originally the top left corner of our viewBox is at 0,0, this means we cannot go below 0 or above the maximum viewBox size minus the current one. Note that given we're initially fully zoomed out, this also means we cannot move in any direction until we zoom in. Another example would be morphing a sad square SVG into a happy circle. We create an SVG with a square viewBox whose 0,0 point is right in the middle. Symmetrical with respect to the origin of the SVG system of coordinates we have a square (a rect element) covering 80% of the SVG. This is our face. We create the eyes with an ellipse and a copy of it, symmetrical with respect to the vertical axis. The mouth is a cubic Bézier curve created with a path element. Just want to say thanks for the huge amount of hard work that clearly went into this in-depth post; I know I’ll be referring back to it repeatedly. Over the past few months I had to start writing animations in js instead of standard css if the animations occur in a locally located page nested within a div within a div within a div the css animations start to act wonky. (The first div has a local page loaded into, the second div is within that loaded page and is used as a decorative container that contains the third div that loads another page within it based upon some php). I’ve found using a deeply nested system like this(or one that goes 4-5 divs deep) is very effective in displaying specific information, very fast loading according to google lighthouse tests, and gives the appearance of a one-page-site white allowing the developers(myself) to create smaller components that are easy to plug-n-play into a site.